A simple idea out of ordinary life and maybe some intuitive guidance led to a concept and a company. Incorporated 2011 Meganews Sweden AB today is a startup venture with a share capital of 10 million SEK – wholly owned by family controlled Upland Securities AB. After initially having carried out conceptual studies and copyright penetration, followed by project organizing and software development, today´s focus is on proof of concept activities related to market potential and technical verification. 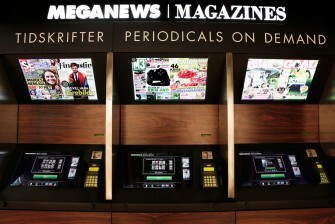 Our present orientation is to the work out of a corporate structure for the next step, taking Meganews Magazines abroad. Our strategy for deployment of the concept is to use a partnership model, with licensed partners building their own single purpose entities. A prospective partner will have the exclusive right to explore the Concept within a certain country or territory. Together with Ricoh we will offer the complete hardware as well as software, service, support, toner and paper. In other words all needed to establish a viable operation with national content providers.